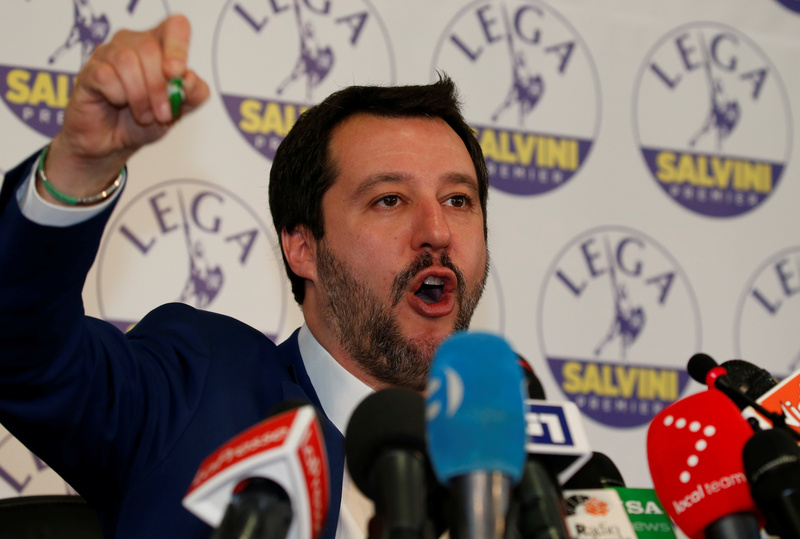 Italy’s anti-establishment 5-Star Movement and rightist League plan to ask the European Central Bank to forgive 250 billion euros of Italian government debt, equivalent to 11 percent of its current stock of 2.3 billion euros, according to a draft of their coalition programme obtained by Huffington Post Italia. The 39-page wide-ranging document also calls for the euro zone to create “economic and judicial procedures that allow member states to leave the monetary union”. The two parties, which together could control both houses of parliament, are locked in coalition talks two months after an inconclusive general election on March 4. According to the draft programme, the parties also aim to use European Union funds to part-fund a so-called citizen income to boost welfare for the poor and unemployed. The parties are also seeking to cut taxes and reform a landmark 2011 pension law that raised the retirement age. Other provisions include calling for an end to sanctions against Russia, and the creation of a Conciliation Committee that would sit above the executive with the power to influence government policy. The document also recommended extensive use of wiretapping and undercover agents to fight crime and corruption. 5-Star and the League said in a joint statement issued late on May 15 that the Huffington Post article referenced an old document that has since been considerably modified. Both parties said they have decided not to call into question the single currency. The draft document published by Huffington Post Italia was dated May 14. The League's economic adviser Claudio Borghi told Reuters on May 16 that the parties were proposing to not include Italian debt bought under the ECB's quantitative easing programme in the country's debt-to-GDP calculations, rather than outright debt forgiveness. 5-Star party leader Luigi Di Maio told reporters on May 15 that he hoped a government could be formed on May 16. Italian government bond yields rose on May 16, with the country’s spread over 10-year German debt jumping as much as 10 basis points to 140 basis points. The spread was 136 basis points as of 0805 GMT.